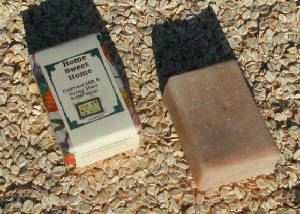 Your home will be a castle with the moisture and lather this bar provides. We add Goatmilk and Shea Butter and top that with a soothing scent and ground oats. Oatmeal is a starch and on your skin starches are softening! This great unisex scent blend works for men and women. The ground oatmeal is soothing, softening, and will mildly exfoliate. The goatmilk adds a creaminess to the lather. The honey is a natural antioxidant and also has antiseptic and antibacterial properties.